Nothing too sinister or alarming in that, except it was at 3:30pm in a car park in Newcastle. Fortunately I wasn’t lying comatose round the back of the bins, instead sat in the driver’s seat of my van whilst the boys were playing away in the park, but it’s the third consecutive day that I’ve totally flaked out mid-afternoon. I’m ill – Except I’m not, I feel generally good. I’m lacking sleep – Granted I have been up at 6:30am and out training early the last couple of days but that’s nothing new and I was in bed by half ten so still getting a decent amount of kip. I’m physically depleted – And here is the most likely culprit. Daft as this sounds, Mr. Jornet is slightly to blame here! Following the Ring of Steall race at the Skyrunning World Champs a couple of weekends ago we paused the car on the way back to the airport to watch the leaders of the Glencoe Ultra come through. Up front was Kilian Jornet, belying the sodden, draggy ground and punishing gradients to extend his lead within our view, interspersing fast walking with skippy steps that no other competitor seemed willing to, or capable of matching. Impressive in itself, but as many of you know, he’d also won my race the day before, demonstrating superhuman powers of instant recovery after obliterating the RoS course record. I was both inspired and intrigued. Generally after a tough race like that I’ll have an easy week, allowing sore muscles to regenerate and batteries to recharge. Having witnessed that performance I decided to trial a new approach and see if I could push on through the recovery and subsequently come out stronger. Sunday was a write-off. I didn’t get home til after eight and so the process began on Monday with a solid core/strength session and then a stiff-legged hilly eight-miler to re-awaken the body. It felt better than anticipated so on Tuesday it was back in the gym followed by a mountainous eleven-miles. Expecting around 1hr 40, I was surprised with the comfort with which I ran 1:32:59, despite strong headwinds. Things were looking positive. Wednesday witnessed storm Ali wreaking havoc on the forest and a rare attack of sense kept me inside rather than dodging the crashing branches, so I put in a full gym session, a tough hour of circuits and strength training to excuse the missed run. Feeling perky, Thursday saw a return to the eleven miler and a really solid 1:28:07, the loop does include an ascent of Slieve Donard amongst around 1200m of ascent before you pick apart my pacing! I was feeling relaxed with legs and body responding really well to the workload. I did another gym session for good measure before rounding out the week with yet another strength session and a moderately good tempo session, legs turning over fast but unable to quite elevate heart rate to the usual 170bpm. I’m delighted to be involved in the new Cycling Ireland Level 2 Coach qualification as a mentor which meant Friday evening and the weekend were spent enjoying an extremely well put-together but mentally exhausting course. By Saturday night I was reduced to monosyllabic grunts, kindly tolerated by my mate Brian who put me up for the night. I did no physical training until a gym session on the Monday afternoon and so felt that the body should be raring to go even if the brain was still slightly fuzzy. It needed to be. 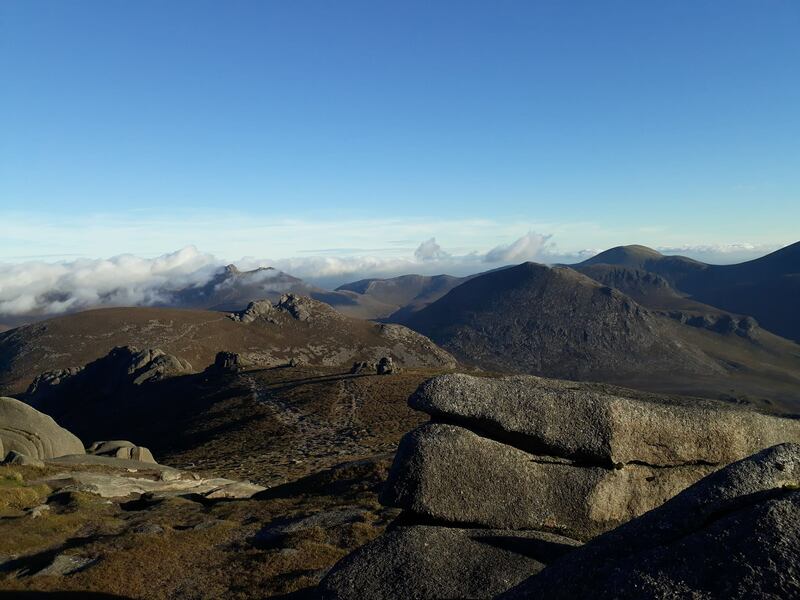 Tuesday was the much feared Triple-Donard, seventeen miles and 2550m of climb and descent, all taken at an attacking pace for a well-measured 3:16:04. That time is way off PB but the headwind in the valley was constant and sapping, gusting up to 40mph, stalling progress and draining essential reserves. A pacy ninety minutes on the bike on Wednesday invited the initial afternoon crash, an almost narcoleptic loss of consciousness sat bolt upright chatting to my boy shortly after picking him up from school. I don’t care how tired I am, if it’s like this I’m heading for the hills! 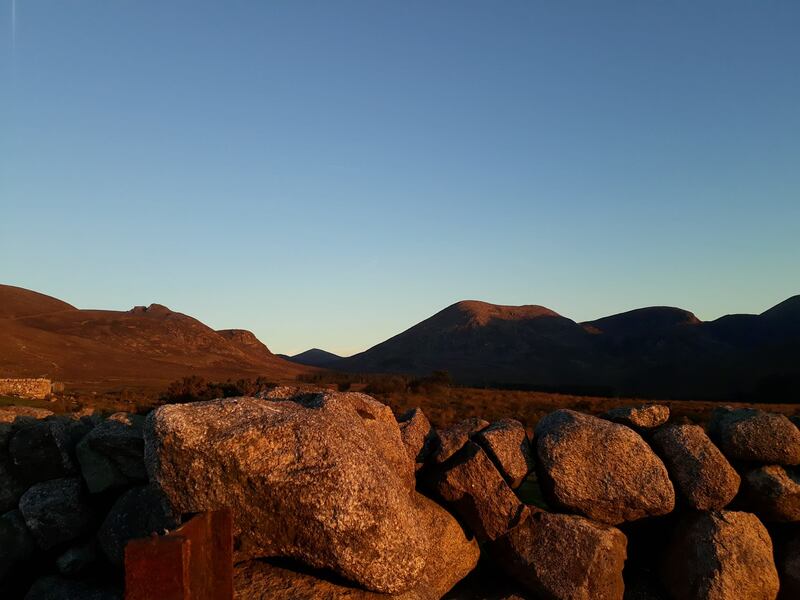 An early night and really good sleep gave the green light to a 6am strength session followed by an absolutely stunning ninety minutes in the high Mournes. The still, crisp air was sweet to taste and the gradually rising sun tantalisingly lifted shadows to bathe the hills in warm tones. Pure fuel for the soul but unfortunately not the legs as I scraped around the loop, that feeling of being slugged by fatigue all-encompassing. Unsurprisingly I was back in slumber-land briefly again after lunch. And so to today, another dawn session but much more chilled out, taking advantage of bone dry trails and crystal skies for seventy minutes of pure pleasure, smashing out Enduro loops on the Stanton. Tiredness wasn’t particularly apparent until I woke with a start in the car park, wondering where the hell I was. As a generally insecure athlete, this unaccustomed lethargy has prompted alarming questions. Is there an underlying health problem? Is form deserting me? Confidence slipping away, staring up to the peaks with trepidation rather than desire. Writing this is both cathartic and knowledge-affirming. It’s clear that this experiment has demonstrated my ageing body is unable to simply breeze on without the usual spell of recovery. I’ll tone down this weekend before seeing how next week pans out with a speedy jaunt around the Seven Sevens on Monday and then a couple of faster sessions to tune-up for a possible weekend race. I hope the siestas will be superseded by having energy to burn, a feeling well craved at competition time. Was it worth it? Absolutely. Learning is never wasted and all being well I’ll come back really strong following a touch more rest time. A few years ago I discovered that tapering is actually detrimental to my performance, with hard sessions up to two days before events actually reaping sharpness rather than sluggishness. Without experimentation that knowledge would’ve remained untapped and I’d have continued to adhere to common practice. We’re all unique, life differs for everyone, mental strain, physical recovery, heavy training loads, stressful jobs, kids, diet, sleep patterns, every one of us treads our own path. Treat your body as a science project once in a while, ignore the textbooks and seek your own results. You might unlock a hitherto unknown few percent of power, or you may nod off outside Tesco, either way, nothing ventured, nothing gained. It’ll lift the soul but sometimes the legs are too far gone. Just have to stop and admire instead.